Description: MP 353.8 BNSF Fort Worth Sub - Lead unit on a northbound transfer of empty automultilevels to IMF at Haslett. Description: NS 19K rolls through the crossover near Benton Street after setting out some cars in the yards on the Huntington District. Description: A going away view of this trio as they roll east running light on the Wayzata sub. Description: Rolling east running light as the October sun sinks lower and lower are these three GE's. Description: More GEVO's and a Dash-9 move BNSF Train Z WSPSTO9 10 towards California in a hurry. Description: A mixed freight passes under the signals below Dayton's Bluff. Trailing are CSXT 335 & BNSF 6874. Description: The H-KCKDEN passes over Commercial Street in downtown Trinidad, Colorado on its way to pick up some cars on the "BN-Santa Fe" transfer track before heading north toward Denver, Colorado. Description: Quite the stalker, the 848 is leading another train for me to see. This is the H-NTWGAL with a decent consist. Description: This is what the current days would have looked like had the BNSF and CN merged. Hell, I'd be for it, atleast one of the best railroads in the US would still be around, Wisconsin Central Ltd. 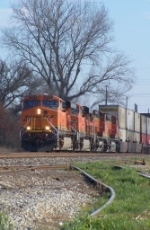 Title: BNSF 848 leads an autorack train into Wentzville yard as it will hit the sideing to let another eastbound to pass it up. Description: The date isn't correct, but the 848 pulls a loaded grainer up towards MP 53, heading to the chicken farms..